In China the dragon is a symbol of good luck. But some local Chinese-Americans have charged that the "giant dragon" of Guilin has bled them dry. Over a dozen investors from Brooklyn, Queens and Nassau County maintain that they and nearly 100 others were bilked out of $5 million in a project to build a theme park in southern China that was to open in time for the Olympics. In a lawsuit filed late last month in State Supreme Court in Manhattan, 14 investors alleged that local Chinatown businessman Foster J.P. Liao and two companies promised to build the Eastern Giant Dragon Theme Park in Guilin city, south of Beijing, in time for the opening of the Beijing Olympics. The 2,600-acre park was to have a large stone dragon stretching 5,009 meters – just over three miles – according to the complaint filed in the case. Liao and others told investors that they could double or triple their investments and that construction would be completed "no later than the commencement of the Beijing Olympic Games in August of 2008," the complaint stated. However, the investors said in their breach of contract and fraud lawsuit that as of January 2008 construction on the park had not started and that investors were told that Chinese law forbid the construction. Investors asked Liao and other defendants for a return of their money but were rebuffed, according to court papers. "Many of them borrowed the money from friends and relatives with interest on it, now they are in debt because of it," said investor attorney Ming Hai of Flushing and Garden City. Mei Lan Tang, 57, a landlord and salesperson from Ridgewood, told Newsday that she invested $70,000 in the project and was told that each $10,000 would allow investors to have their names inscribed on individual gold dragon "scales." "This is for the Olympics and to help in our native Guilin and national pride," said Tang, though an interpreter, about the sales pitch she received on the project. Tang claims friends in Guilin told her recently that the park and the dragon haven't been built. Yuk Lin Sun, 52, of Bensonhurst, said she invested $40,000 and also heard from friends in China there was no park. At Liao's office at 401 Broadway in Manhattan, officials there didn't want to comment about the lawsuit but insisted the park and the giant dragon existed. They said Liao was in China. The company officials declined to show a picture of the park or dragon. In an e-mail a travel agent in Beijing said it was unclear when the park would open but said there was a dragon structure in Guilin that served as a museum. "I just think people have to be more prudent when somebody approaches you with a plan that sounds good," said Ming Hai. For a Chinese emigrant who endures the ordeal of transplanting himself to New York City , $35,000 may seem like a reasonable price for a coveted green card. Intense demand for this document, which affords legal status to live and work in this country, may have converted as many as 100 new arrivals from China into easy pickings for two Flushing immigration service centers that bilked them of a total $3 million to $4 million, according to attorneys for the victims. The alleged scheme, which is receiving extensive coverage in the local Chinese press, centers on payments of as much as $35,000 apiece for help with filing green card applications in recent months. The immigrants, who have yet to go to local authorities, turned to local attorneys who say their clients received few services and sometimes no services after naively - or desperately - paying the equivalent of 30 times the going rate for such application assistance. In some cases, arranged marriages and quick divorces may have been part of the deal. "I am trying to help these victims, and I want the authorities and general public in on this issue," said Flushing attorney Ming Hai, who is looking into filing a lawsuit for some of the immigrants. The Flushing furor surrounds two companies identified by lawyers, businessmen and news reports as Jin Quan Agency of 39-15 Main St. and Guong Hua Agency at 36-09 Main St. According to Hai, no fewer than 20 aggrieved immigrants have approached him with claims that the fees they paid generated no service or result. About 100 victims exist, but they are fearful of speaking with law enforcement authorities or talking openly with the English-language news media because of their immigration status, he said. Immigration centers throughout the city carry out a number of legitimate functions, such as translation, job and apartment referrals. In August, Newsday detailed how some of the service centers appear to law enforcement officials to be involved in the unauthorized practice of law. These centers advertise exclusively in the ethnic press and are unregulated, as state legislation to require licensing has been in limbo for three years, city officials say. It was in July when people claiming to have been clients of Guong Hua showed up at a medical office that had taken over the space. A physician there told Newsday that four or five customers showed up and were upset and disappointed to learn that Guong Hua was no longer there. Some of the Guong Hua customers then approached Hai to say that the service center had taken their money for green card applications and after several months had not delivered on its promises, the attorney said. Some had received temporary work authorizations by the time the company disappeared, he said. Hua also said local police told the immigrants to go to Queens prosecutors but people in the district attorney's office referred them back to police. A spokesman for District Attorney Richard Brown said it has no complaint on file about the two immigration service centers. Similarly aggrieved customers surfaced in October in connection with the Jin Quan Agency, which occupied a two-room suite at 39-15 Main St.
A representative of the building's owners said the company has not paid the monthly rent of $1,400 since August and is unreachable, so the owners have changed the lock on the door and plan to rent the space. Business incorporation records show that three people serve as its principal owners; none could be reached for comment. Copyright © 2002, Newsday, Inc.
Over the years, American law enforcement officials have voiced frustration about probing scams in immigrant communities because many newcomers fear complications if they complain about being ripped off. But Chinatown acupuncturist Chang Yun Hui doesn't want to suffer in obscurity anymore. In an unusual move, Hui said he and dozens of other Asian immigrants allegedly victimized in a Flushing Green-card scam have banded together, hired lawyers and a private investigator, and complained to any public official who will listen.Hui and other immigrants, some of whom may be illegal, have alleged that the Guong Hua Agency, which operated out of a small office at 39-06 Main St. in Flushing, was part of a scam that fleeced them out of an estimated $4 million. The immigrants and their lawyers believe Guong Hua was also linked through business dealings to the Jin Quan Agency at 39-15 Main St. Complaints about both agencies, reported extensively in the past year in Newsday, involve allegations that the firms' staffs charged clients up to $35,000 each for help in filing green-card applications. That fee is nearly 30 times the going rate charged by legitimate businesses. The clients said they received little or no services. 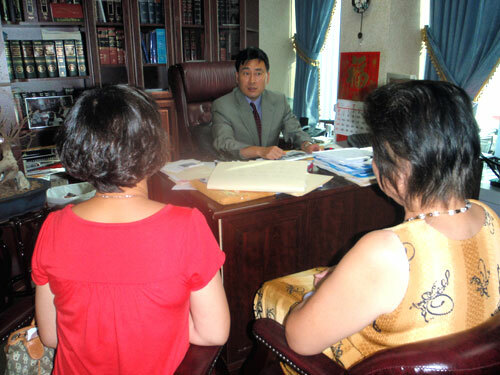 "I got cheated big-time," Hui, 54, said in an interview translated by his attorney, Ming Hai. "I must take this kind of action. I believe in the American system." It was through word of mouth in the city's Chinese community that Hui learned of Guong Hua and in 2000 asked the agency staff for help in getting a green card as a skilled worker. He practices as an acupuncturist in an office on Bowery in Manhattan. The fee, Hui recalled, was $34,000, of which $27,000 was paid. Attorney Ming Hai said that the forms were filed by the agency staff for Hui with the Immigration and Naturalization Service. But the documents, which were examined by Newsday, contain false information, including the claim that Hui was eligible to live in the United States under a law designed to protect Chinese students who fled China after the Tiananmen Square revolt in 1989. Hui, in fact, entered the United States on a tourist visa in 1998 and was unaware of the false statements in the application, Hai said. Though Hui did receive a work authorization card and Social Security card, the green-card application was false and was denied by federal immigration officials, Hai said. "None of them will get green cards. They are fraudulent claims," Hai said of the Guong Hua clients. According to Hui and his attorneys Hai and Eric Spinner, scores of other immigrants, perhaps more than 100, say they were cheated by the Guong Hua and Jin Quan agencies. Assuming an average fee of $35,000 for each immigrant, the losses range from $3 million to $4 million, Hai said. At first Hui and the other agency clients did little to seek redress of their grievances. But that has now changed. Hui said a private investigator in China was hired who was able to track down a woman allegedly involved in the Guong Hua operation. The woman has not been charged in China, but the private investigator has told police in the Chinese city of Wu Han, the capital of Hubei province, about the complaints of the Flushing residents about her dealings, Hai said. In recent weeks, Hui said he has gone to officials at the Chinese Consulate in Manhattan, as well as Councilman John Liu (D-Flushing) and the staff of Queens District Attorney Richard Brown. Liu said Hui and others told him of their losses and provided him with copies of their documents. Liu said that he has been hearing numerous tales of woe from other immigrants about agency scams. Hui said he also spoke with an official in the office handling overseas Chinese matters at the Chinese Consulate and was told that if 100 victims sign a petition, Chinese officials would ask U.S. authorities to commence an investigation. Officials at the consulate said they had no recollection of contacts with Chinese immigrants alleging immigration fraud. But an official with the Queens district attorney's office who asked not to be named said numerous fraud complaints about the Guong Hua and Jin Quan agencies are under investigation. "There are so many vultures doing the same thing," said the official, adding it also is a problem in Hispanic communities. The problem, said the official, is that many of the people who use immigration agencies know their applications contain false information. This creates a problem in building a case against such agencies, the official said. More than 1,000 Chinese earthquake victims (and Manhattan attorney Ming Hai) have demanded that actress Sharon Stone put her money where her mouth is. Fox News (via the New York Post) is reporting that they're asking for a $1-billion payout from Sharon Stone. Yes, she really did say that. Open mouth, insert Manolo Blahnik. "For the families who have lost their loved ones or lost limbs or suffered severe injuries, your ... statement and act has caused extreme emotional distress," Ming wrote, citing the comments La Stone spouted at the Cannes Film Festival, where she -- along with Madonna -- helped raise barnloads of bucks for AIDS research at the annual AMfar charity dinner and auction during the festival. In a public apology last month, Stone, 50, said she "could not be more regretful for that mistake." But that wasn't enough. French fashion house Christian Dior immediately dropped Stone from its Chinese ads. And the Shanghai International Film Festival sniffed that she was not welcome at this year's event. Plus PETA has offered to scan her brain to find her heart, although that's got nothing to do with quake victims and everything to do with the fact that Sharon just loves to wear dead animals. What do you think? Should Sharon Stone have to pay damages to quake victims? And is $1 billion enough? It was an inexcusably thoughtless and ignorant thing to say. But jeepers, what does a girl have to do to say she's sorry these days? Everyone knowledgeable about the criminal case against Zhai Tiantian seems to agree on one point: During a telephone call on April 15 to the Stevens Institute of Technology in Hoboken, N.J., Mr. Zhai completely lost his cool. What he intended to say during the call is a matter of dispute. All the same, Mr. Zhai, a former Ph.D. candidate at Stevens and a Chinese citizen, has spent the 11 weeks since then in the Hudson County Correctional Center in Kearny, N.J., on charges of making “terroristic threats,” and faces possible deportation. The case has bloomed into a minor international incident, tracked closely by the news media in China, where it has prompted outrage in some quarters. 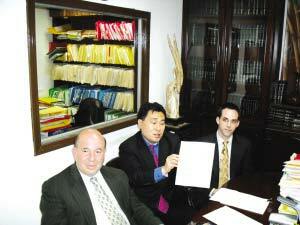 Chinese diplomats in New York have appealed to the university to help Mr. Zhai. Mr. Zhai’s advocates say that while he used inflammatory language, he was speaking metaphorically, to describe the effect of a lawsuit he planned to file against the university challenging his suspension. Jerry Sova, a friend who has stayed in touch with Mr. Zhai by phone and letter and visited him in jail, said the former student had admitted using provocative words but insisted he never had any intention of committing arson. To make matters worse for everyone involved in the case, Stevens officials say, the charge against Mr. Zhai has been misinterpreted, particularly in the Chinese news media, as accusing him of acts of terrorism. If convicted, Mr. Zhai faces a penalty of as much as three to five years in prison, Mr. Adams said. Mr. Zhai, who is from Xi’an, a city in central China, enrolled at Stevens in 2000, said one of his lawyers, Ming Hai. After receiving an undergraduate degree and two master’s degrees, Mr. Zhai began pursuing a doctorate in engineering. His disciplinary case at Stevens began in the spring. University officials, citing confidentiality rules, would not reveal the exact nature of the trouble, but Mr. Zhai’s lawyer and friends say it began when a relationship with a woman turned sour. In early March, the woman, a graduate school instructor at a university in New York City, filed a harassment complaint with the police, Mr. Hai said. A friend of the woman, a professor at Stevens, also became involved in the romantic dispute, complicating Mr. Zhai’s life at the school and perhaps leading to the university’s action against him, Mr. Hai said. “The overall conclusion is that your presence on campus is a health and safety risk to members of the Stevens community,” the letter said. On April 15, Mr. Zhai called the main administration building at Stevens, officials said. A campus police officer answered, and Mr. Zhai told the officer what was on his mind. That evening, the campus police, accompanied by federal immigration agents, appeared at Mr. Zhai’s door and took him into custody. Mr. Adams said Stevens, as required by law, had earlier notified immigration officials that it intended to expel Mr. Zhai — a move that would effectively cancel his student visa. Mr. Zhai’s case was supposed to be presented to a grand jury, but it is unclear whether that process has begun, Mr. Adams said. Mr. Hai said the authorities would allow the criminal process to run its course before starting deportation proceedings. For weeks Mr. Zhai was unable to post bail because of a New Jersey requirement that he turn over his passport, Mr. Hai said; immigration officials had taken the passport when he was arrested. The state lifted the requirement, and a friend of Mr. Zhai’s posted bail this week. But Mr. Hai said that his client had not been released, and that federal authorities were expected to transfer him to an immigration detention center. News of the case has been reported across China, and at least one newspaper, the English-language edition of The Global Times, which is backed by the Communist Party, has found geopolitical resonance in the matter. “The incident lays bare the deep-seated disrespect for Chinese people by the U.S. government, which has long boasted its respect for freedom and human rights,” a May 27 editorial said. A version of this article appeared in print on July 3, 2010, on page A15 of the New York edition.